Prospect Avenue was just another dusty lane traversing the Cahuenga Valley countryside in 1899 before the tiny settlement of Hollywood hatched an ambitious plan to improve its main street—and with it the town’s stature. Hollywood’s first priority? Luring the tracks of Southern California’s growing trolley network down the center of Prospect. An interurban rail line to a town of only 500 didn’t make much financial sense, though, so Hollywood’s landowners—led by Peter Beveridge, H. J. Whitley, and Griffith J. Griffith—enticed the Los Angeles Pacific Railway to town with a $15,000 bonus. On December 15, 1899, the company began laying its iron rails atop thousands of redwood rail ties, and five months later the first electric railcar from Los Angeles rolled down Prospect Avenue. 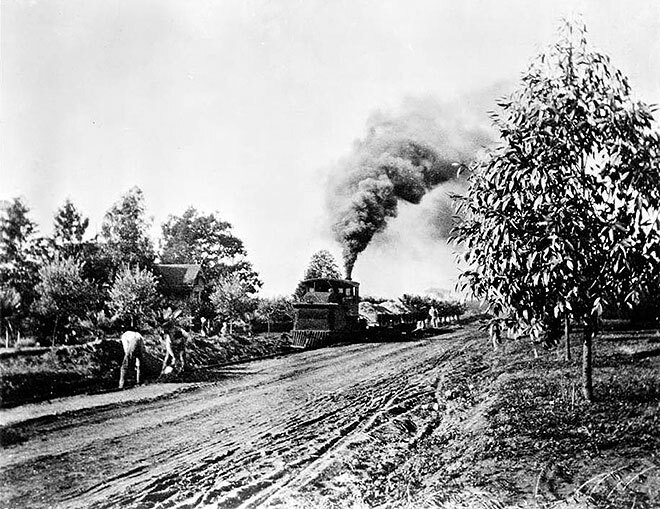 With the rail connection achieved, Hollywood’s developers next turned to improving the roadway itself. Over the course of several months beginning in early 1901, what started out as a rutted carriage road only 20 feet wide became a grand 100-foot boulevard. Graded with granite gravel and topped with a macadamized road surface, the new boulevard stretched two miles between Laurel Canyon and Western and, with the electric railway that ran down its center, seemed to announce Hollywood’s arrival as an important suburb of Los Angeles. A new name for Prospect Avenue—Hollywood Boulevard—came a few years later. Fame was not far behind. Above: Workers grading Hollywood’s Prospect Avenue, circa 1899. Courtesy of the USC Libraries – California Historical Society Collection. Previous articleCana Rum Bar Asks: Piña Colada, Blended or Shaken?